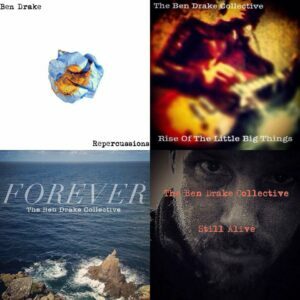 The Ben Drake Collective are folk/rock musicians who work as a team, rather than as competing individuals. Ben Drake himself says: ‘the song is greater than any of us; it’s not everyone playing just to be heard. If a song sounds better with one of us not playing on it then that person is happy to sit that one out – that includes me.’ The collective performs as a big-sound rock band with guitarist Ben Drake and Becky Blackwell on vocals, Arup Ghosh on drums, Gary Bates and Simon Parry on guitars, Paul Kimmett on keyboards and, Liz Townsend on cello. The line-up for their acoustic sets is Ben, Becky, Gary and occasionally Paul. I asked Ben about where their multi-layered, eclectic sound comes from. Leslie: You play a lot of your own, original songs. How do you write your music, from first idea to finished piece? Ben Drake Albums. You can listen to their music here. and download their first two albums for £2.99 each here. Ben: I’ve been recording for a few years now. My first album ‘Repercussions’ was a solo effort that was ticking a box of things I want to do in life. I wanted to release an album and so it was an experiment in writing songs, I made up stories, imagined scenarios and wrote from there. After its release I had enjoyed it so much I wanted to record another and began writing a follow up. This coincided with a dramatic change in my life which heavily influenced my song writing and I began writing about my situation and things I was going through, it was almost like a therapy. Since then everything I have written up to now has been directly influenced by things I am going through at the time of writing. Once I have a rough demo I take it to the band and we all put our stamp on it. It’s sometimes painful to have other people pull your music apart and change things about, but it usually works out for the best. One thing that has been so refreshing, working alongside the band, is that we all believe the song is greater than any of us; it’s not everyone playing just to be heard. If a song sounds better with one of us not playing on it then that person is happy to sit that one out – that includes me. There a few songs where lead vocals are taken over by Becky, and I’ll sit there twiddling my thumbs! Leslie: I’ve heard you play intimate folk-influenced acoustic and big-sound electric blues. How do these two styles relate and inspire each other? Do you play your own songs in different styles – and if so, how does that change the piece? Ben: We have two line ups for the Collective. 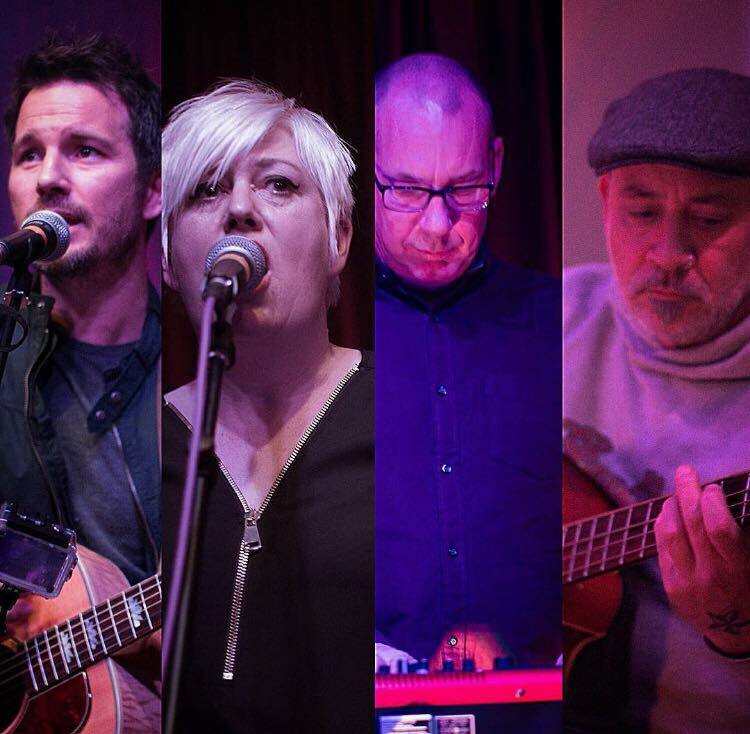 We have the full band which can be up to eight people and we also perform as an acoustic line up which is three to four of us. Here we will strip the songs down and slightly change the arrangements so they are interesting in an acoustic format. I think the folk aspect comes from the acoustic line up, or when I play solo gigs as we are falling into the singer/songwriter bracket. The blues sound we have had of late has stemmed from the last EP which was very blues Influenced. I was experimenting a lot with slide guitar at the time of writing it. We try to do at least one song in a different style on each release. On our new album we have a song inspired by the 70’s disco scene. Very ‘Chic’ and I get to release my inner Nile Rogers! It’s probably my favourite song off the album. 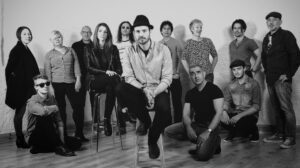 The full Ben Drake Collective, left to right Liz Townsend, Joe Galvin, Becky Blackwell, Paul Kimmett, Adi Chase, Paul Ludlow, Ben Drake, Gary Bates, Kate Galvin, Arup Gosh, Conner Wells (sitting down) James Baron, Simon Parry. Leslie: What are the wider roots of your music? Who do you admire and why? Ben: I have always been influenced by guitar music. I guess my mum and dad are to blame for that, growing up around their favourite artists on the radio was bound to rub off on me. Dad is very into David Bowie, Rolling Stones, Mum likes Aerosmith, Bon Jovi , Bryan Adams. I like a bit of American rock thanks to her! Then in my teenage years 90’s Brit pop exploded onto the scene and I was hooked with the likes of The Charlatans, Supergrass and Oasis, (I was, and still am, a great admirer of Noel Gallagher’s music). Everyone wanted to play guitar at that time, as did I. I just couldn’t put it down. I’m a bit of guitar collector now. Leave me in a music shop for too long and I’m going to come out with one! An artist that I admire at the moment is Esme Patterson. She recorded a duet with Shakey Graves, a blues/folk singer, who is an an absolute inspiration to me. I was listening to Shakey Graves around the time I was writing the ‘Still Alive’ EP. He recorded a duet with Esme quite recently which was the first time I had heard her voice and I was mesmerised. I have followed her ever since and I love her style of energetic rock as well as her unique sound in combining an array of musical genres. She seems to totally lose herself in the music. Leslie: What’s the story of your own personal musical development? Ben: It’s funny I’ve always liked listening to guitar music but had no desire to play it. I was never interested in music at school. No one in my immediate family plays an instrument although I have cousins in the UK and Canada who seem to share my love of playing. However, when I was about 16, out of nowhere, it became an obsession to play guitar. A friend of mine was having lessons and agreed to teach me a few chords to get me started. I remember practising every day for a year until I was able to play to reasonable standard, then we formed a band with two other members calling ourselves The66Kicks. We ended up gigging together for 10 years, played some great venues and built up quite a following. They were great times and I think that’s why I enjoy performing alongside other musicians to this day. Leslie: What’s the difference for you between recording pieces and playing them live? Ben: Generally when we record an album or EP we are looking to produce those songs as close to live as we can. There are always exceptions, as now and then I like to really overproduce a track to see what comes out. It’s exciting for me to experiment with different sounds, however I feel more at home in a studio than on stage. The band are desperate to play live and end up bouncing off the walls during recording sessions! Left to right: Ben Drake, Becky Blackwell, Paul Kimmett and Simon Parry. Leslie: Is there an overall quality, feel, mood or ‘line’ that you want to capture in your music? Is there something individual, a ‘Ben Drake Collective Signature’, you hope to bring to the tradition of music you’re working? Ben: Quite a few people have said it’s hard to describe our sound as we cross so many genres; it’s our biggest strength as well as our biggest weakness. I think the strength of not sounding like anyone else is because we all come from different styles of music and once it all gels together, hopefully we have something unique in our collective. A problem this can cause us is – when lining up a support slot, promoters like to have similar genres on the bill. You can listen to Still Alive – the latest EP by The Ben Drake Collective here. 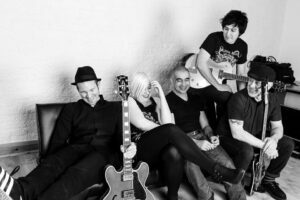 Singing from a very young age, Becky’s background roots and talent in musical theatre lead her into the world of music and bands, forming her own group The Random Standards influenced by the Manchester scene of the late 80s early 90s. Becky is no stranger to the gigging life and has provided backing vocals for Coloryde and lead vocals for The Little Big Things before moving onto adding her gritty yet soulful vocals to a wide range of tracks with ‘The Ben Drake Collective. Gary started out his live music career on York’s thriving open-mic scene in the early noughties, loaning himself out as a backing guitarist at many a beer-soaked lock-in. The return to his native Home Counties eventually saw him join rising Hertfordshire alt-rockers Hey Jupiter. This band’s abrupt demise brought a brief musical hiatus, which was ended by a call from former bandmate Chris Bruton, inviting him to join Ben and others on an eclectic covers set for a local mini-festival on the basis of Gary’s broad guitar-playing ability. And so it was that Gary became an integral part of the early incarnation of The Ben Drake Band, eventually to become part of ‘The Ben Drake Collective’. Simon has been playing since he bought his first bass guitar at the age of 15 using his paper round wages. With a bass guitar collection that has grown over the years, the early Fender being his preferred player, the Rickenbacker his favourite, music influences from Gary Numan, The Police and Boomtown Rats among others give TBDC the underlying back line groove the songs need to come to life. His involvement with the Collective came about by chance, being asked by Ben to play on a new album after seeing him play bass with Coloryde, and is now a permanent fixture in the band. Although the 90s and early noughties were fairly quiet as far as playing or recording goes, Paul found a love for the keyboards again with the newly reformed Coloryde after a brief sabaticle from music. Through mutual friends He was introduced to Ben, and started listening to demos of his new work. After a few rehearsals and with a renewed pleasure for playing in a full live band again, they were ready to start recording the first track – ‘The Rise Of The Little Big Things’ – and after completing the album of the same name, Paul continued to work with the collective on Ben’s new material, becoming a staple part of the band. Liz Townsend is a singer/songwriter, multi-instrumentalist who has worked as a teacher and session musician for over a decade. After graduating with a Masters in Composition, Liz pursued a career in music by collaborating with labels, recording studios and independent artists. Having toured extensively throughout the UK in the band The Floe, supporting well known acts such as Ultravox, Glen Tilbrook, Ade Edmondson and the Bad Shepherds, in venues such as the O2 Academy, Sheffield and The Sage, Liz is now focusing on work closer to home and her own material. Next week, in POLISH, COMING TO THE UK – AN AUTHOR’S EXPERIENCE, I interview Anna Ryland, whose novel, A Second Chance, describes three Polish-born characters arriving in Britain.